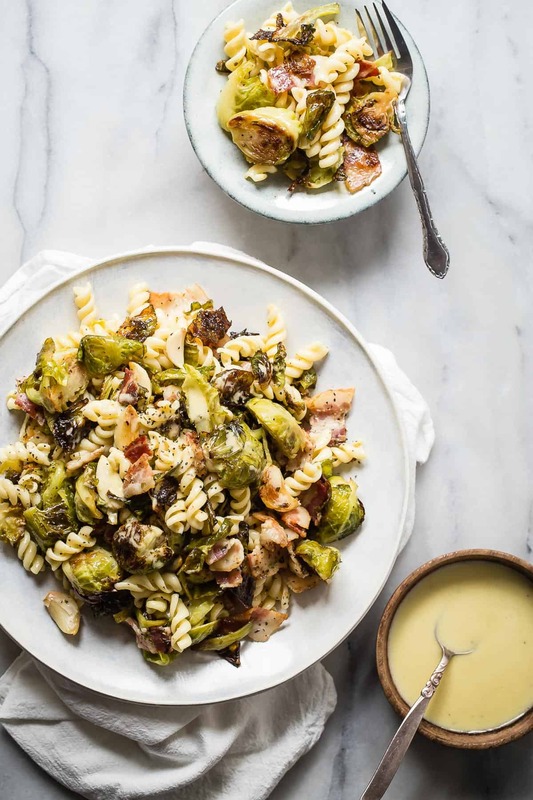 Roasted Brussels Sprouts with chunks of crispy bacon, whole garlic cloves and tossed in a garlic and Dijon dressing. The ultimate summer side dish is begging you to make it! Someone told me that Roasted Brussels Sprouts were the ultimate vegetable. Everyone in my house would raise both hands to that declaration, even my kids. The reason is the crispy caramelized taste that comes from shoving them in the oven for a half hour or so. Bacon is still a hot and heavily worshipped piece of meat. 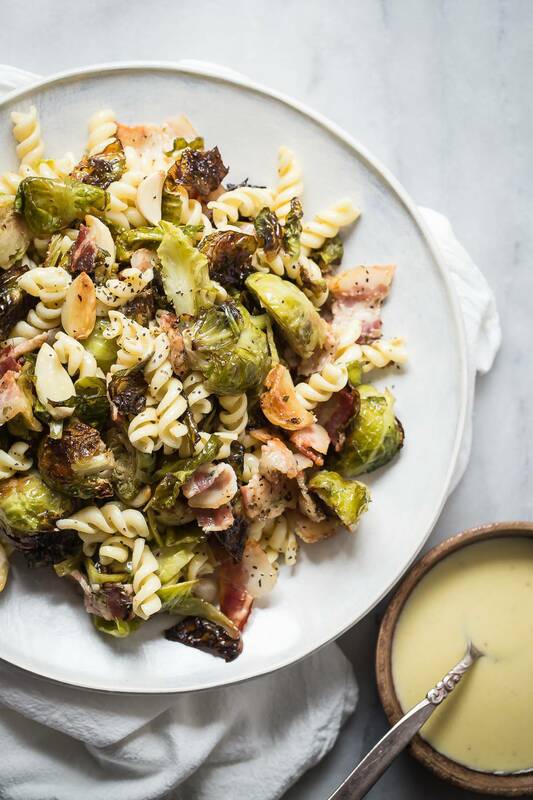 Add it to anything and instantly people want to try it, so cooking it with the brussels sprouts on the same pan lets those little green leaves soak up all of that salty smokiness. I kept these chunks big, ain’t nobody got time for bacon crumbs. 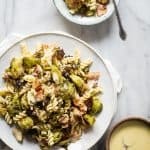 Looking through my recipe index, I found five other roasted brussels sprouts recipes. FIVE! But who can blame me because they’re so delicious. My favorite would be these and only because I love spicy, but a close second are these balsamic glazed brussels sprouts. Whichever one you choose is okay because they’re all winners. If only my mom knew to roast them when I was a kid. Mom, I love you but mushy brussels sprouts was not the way to go. I’m really tempted to make a batch like that just for the memories. 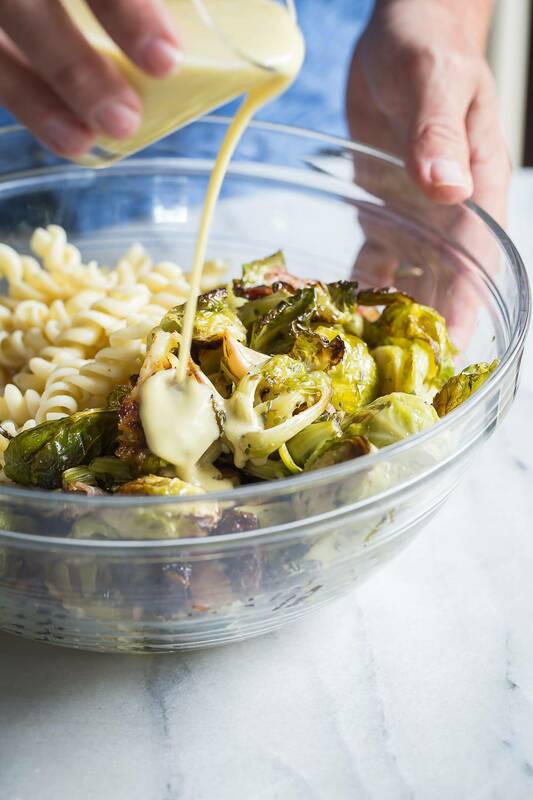 You can skip the dressing or add as much of it as you like. It’s a super simple white wine vinegar, Dijon and garlic flavor. I recommend you to go easy when you add it to the finished recipe. You can always add more but can’t take it away. If you don’t use all of the dressing, keep it for another salad, it’ll work with anything. I dare you to make this salad, and let me know what you think by tagging me on Instagram or Facebook. I love to see what you guys make. In a blender add the lemon juice, vinegar, 1 garlic clove, mustard, salt and pepper. Switch the speed to high and slowly add the 1/2 cup of olive oil until the dressing is well mixed and slightly thick. Bring a pot of boiling water to a boil and cook the pasta as per the directions on the box. Rinse with cold water and let cool. Chop the roots of the brussels sprouts and discard any outer leaves. Cut the sprouts in half and transfer to a bowl. Chop the bacon roughly into chunks and add to the bowl along with the tarragon, olive oil, garlic cloves and black pepper. Mix well making sure everything is coated in olive oil. Transfer the contents to a baking tray lined with parchment paper. Roasted the sprouts in the oven for 30-35 minutes turning halfway through cooking. When the sprouts have cooled, transfer them to a large bowl. Add the pasta and about half of the dressing. Toss well and taste. Season and add more dressing if desired. Place the salad on a serving platter or individual plates and serve at once. 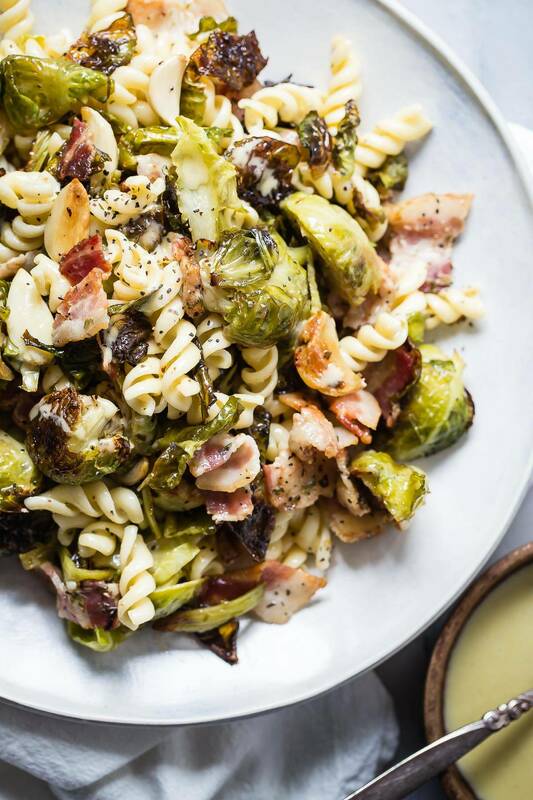 Ultimate summer side dish for sure! This is a meal I can totally face plant into!